Karma Canvas 5M ZIG PRO 360* MESH Bell Tent. 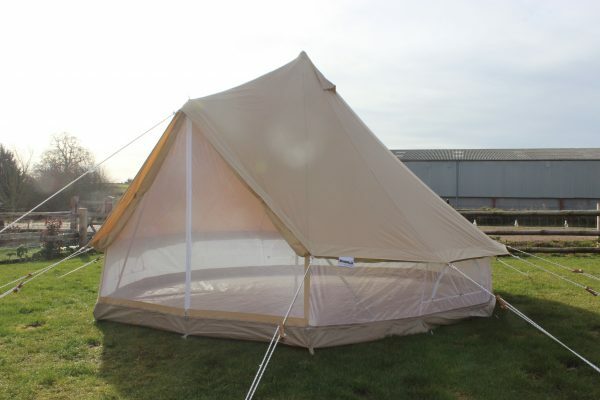 This is the Karma Canvas PRO MESH Bell Tent range, designed with the professional, long term and overseas user in mind, offering integrated mesh doors and zippable mesh walls giving you 360 degrees of bug proof protection. Extra thick Zipped in groundsheet, mosquito/midge mesh door, 360 reinforced mesh walls & 6mm thick guy ropes and chunky wooden guy sliders, upgraded heavy duty pegs. 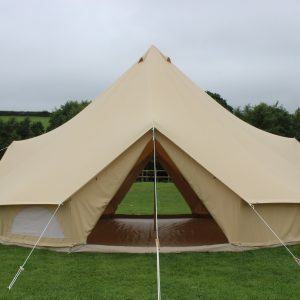 All our bell tents combine the best features of a ‘detached ground sheet’ and a ‘sewn in groundsheet’ bell tent giving you the benefit of both designs rolled into one. 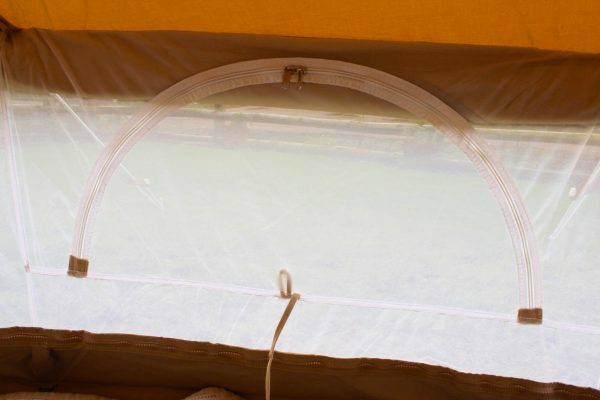 On hot summer days, simply unzip the groundsheet and roll up the side walls to create a refreshing breeze throughout the tent. 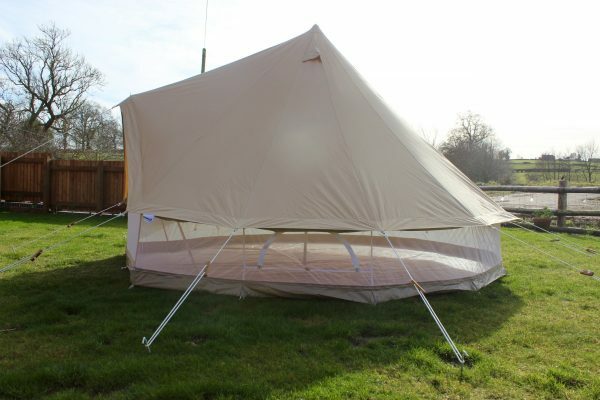 When zipped up, the ZIG groundsheet provides you with a bug and waterproof seal keeping you 100% dry during undesirable weather conditions as well as an optional zipped in mesh wall allowing you to sleep with the walls rolled up without the worry of creepy crawlies visiting during the night. Our ZIG PRO MESH bell tent is an extremely durable, fully weatherproof shelter for all seasons. 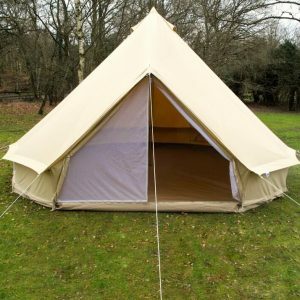 The canvas is stiffer than our normal range of ZIG Bell Tents as it’s heavier gauge cotton, with thicker proofing and quite a lot stronger. 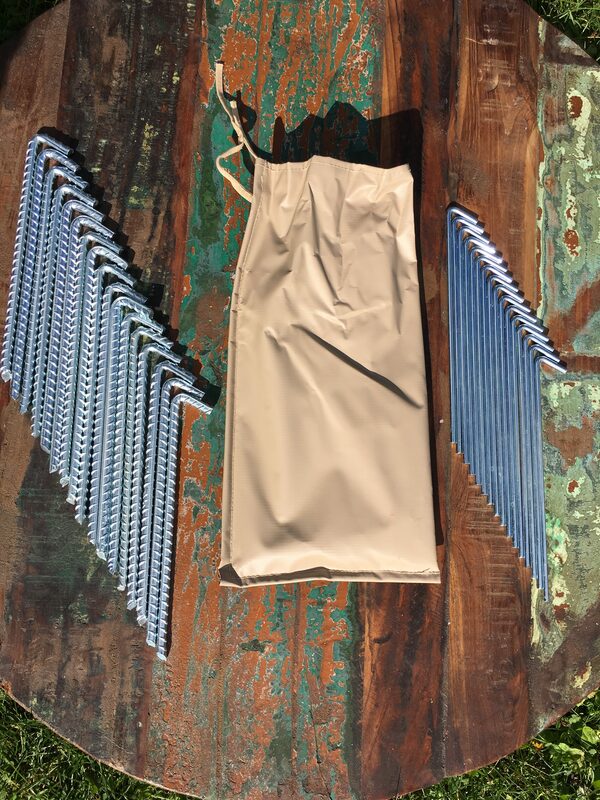 The Ripstop groundsheet is also much more heavy duty than normal. 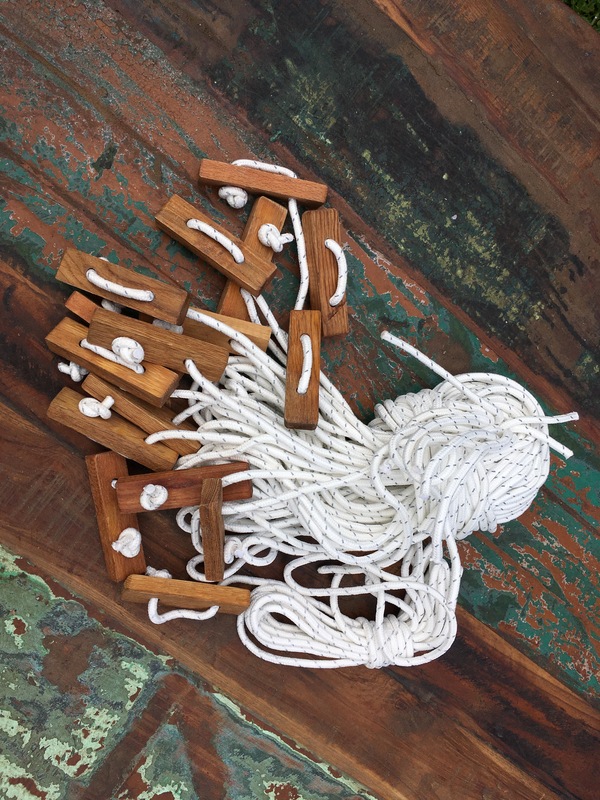 * 6mm, extra thick, guy ropes with chunky wooden guy sliders. * Mosquito mesh secondary door option. Doors now have 3 settings: fully open, mosquito mesh screen, or full canvas doors. * Extra thick, 34mm central pole. 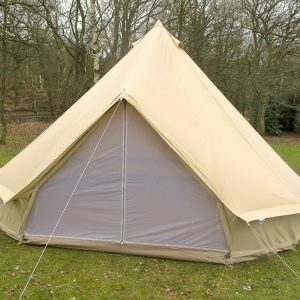 * Fully weather proof and extremely durable 360gsm grams/m2 natural, unbleached, 100% cotton canvas fly. * Double stitching on all seams and reinforced at key tension points. * From new the canvas is treated to be water, mold and UV resistant and dirt can be removed easily because of the protective film applied in these treatments. 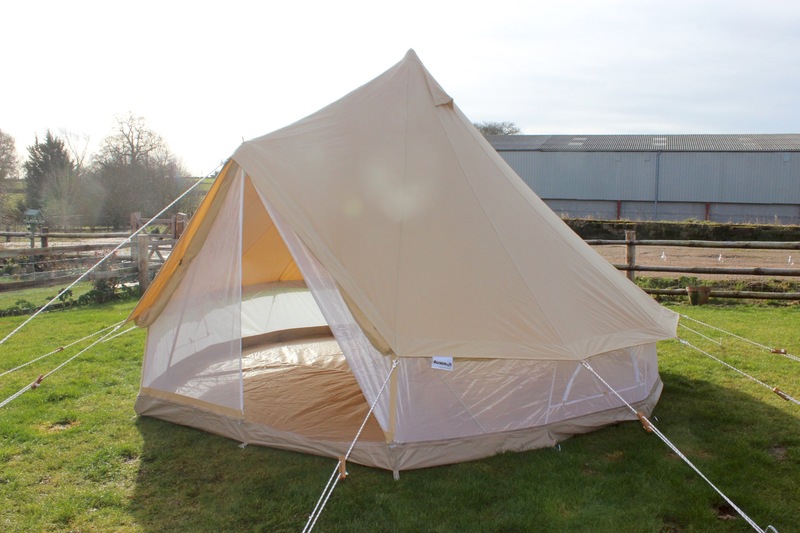 * From new, your bell tent can be used straight out of the bag without any need for treatment prior to use. 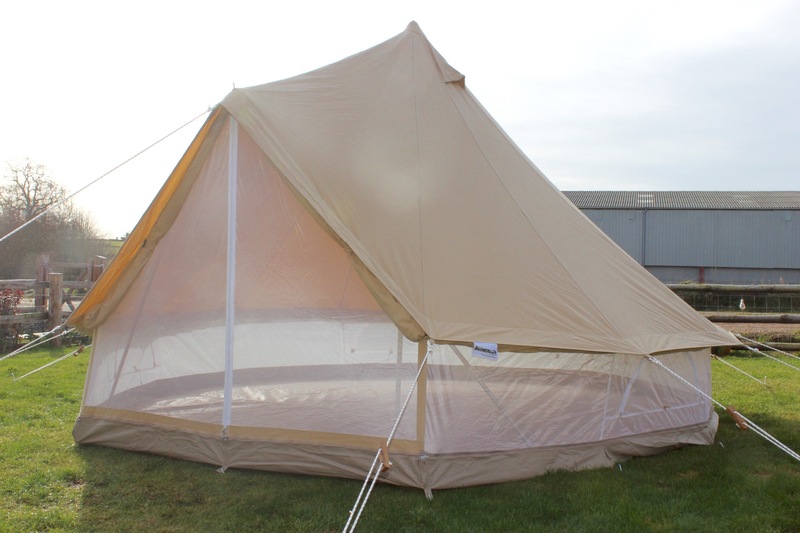 * An A frame covered entrance with an integrated pole footing on the groundsheet for stability. * 4 zipped canvas windows with mosquito mesh lining. When open they allow heat to circulate without letting insects in. * 3 Meshed vents at the a-pex of the tent let out any troublesome heat maintaining a comfortable temperature. 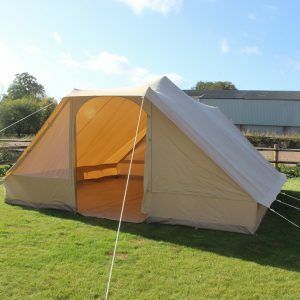 * A heavy duty, extra thick (580gsm grams/m2), fully waterproof groundsheet is fitted (to put that into perspective that’s 3 or 4 times thicker than most standard tent flooring) and has 3 inch side walls around its circumference that is connected to the canvas fly using a heavy duty zip system. This ensures a secure water tight seal and also enables you to unzip the groundsheet from the canvas fly and roll the sides up weather permitting. 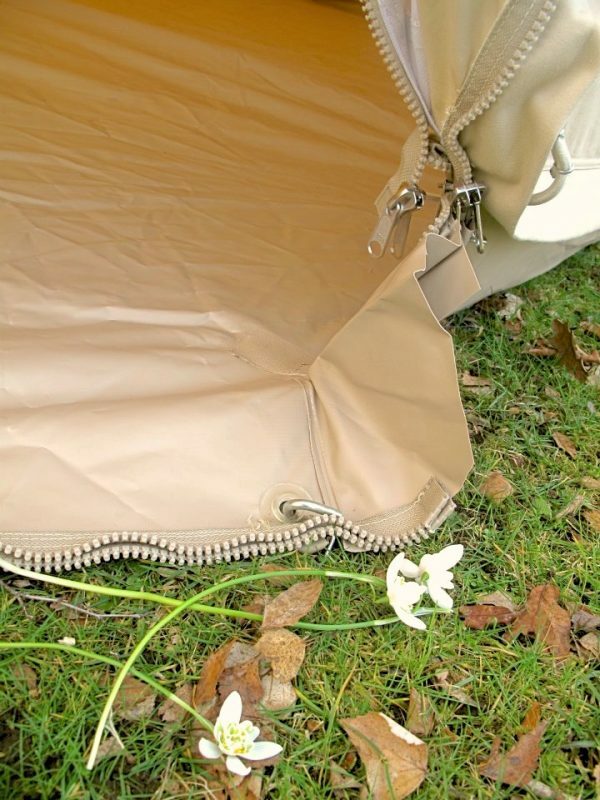 * The zip is protected and concealed by a waterproof canvas flap that spans its length and also a fold down entrance flap has been added to the groundsheet enabling a non trip entry. When clipped up this feature protects you from any flooding. * If needed there’s power cord access at either side of the entrance flap. * Heavy duty zipped front door can be secured by locking the three zips together. * The guys and slides are UV stabilize so they’re not going to fade and perish. 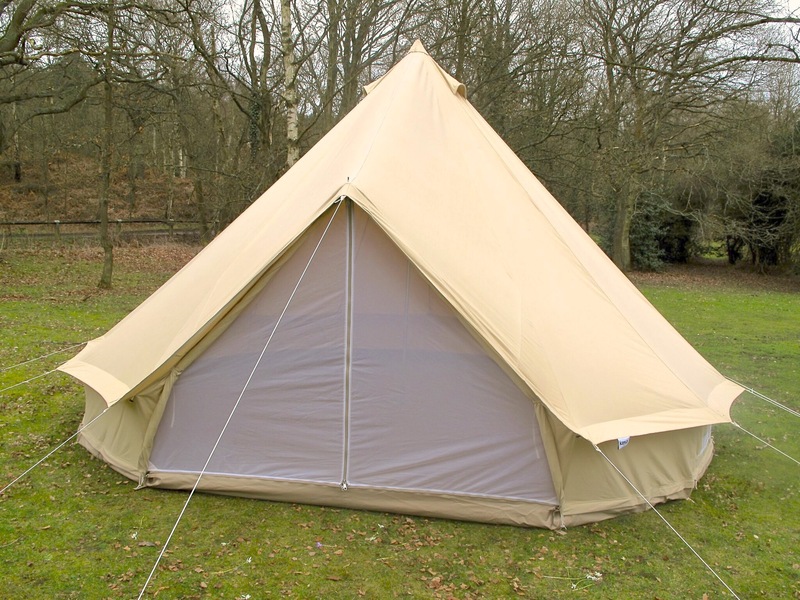 * All our bell tents come complete with loops and attachments to install an inner tent as standard. * Can be fitted with a wood burning stove with the flu exiting horizontally or vertically. * This tent is compact when packed down (90cmx30cmx30cm) and is supplied with a matching canvas bag with shoulder straps. * The 5m bell tent can easily accommodate 4 double air beds with lots of room to spare. With guy ropes fully extended it’s a 7m footprint. 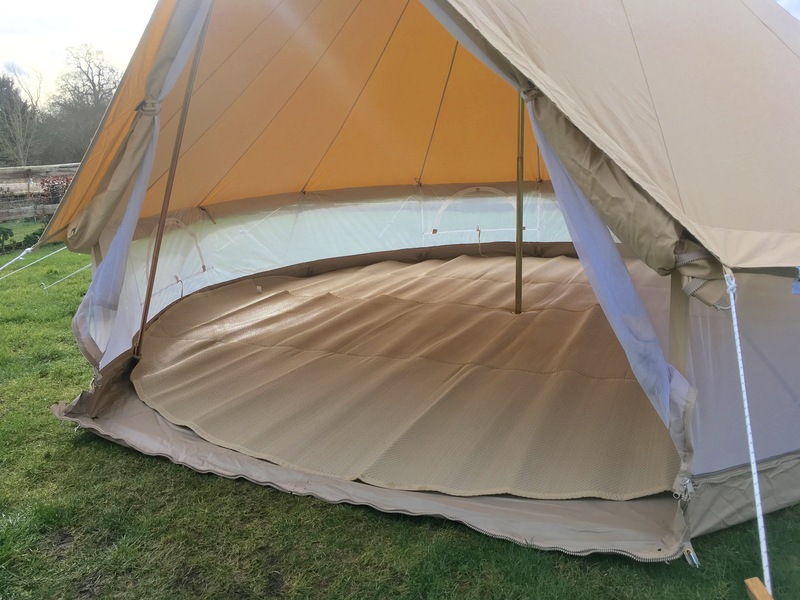 * The beauty of a canvas tent is that it retains heat on a cold day and remains cool on hot day due to its insulate but breathable properties, so little to no condensation issues that you can sometimes face with synthetic materials.